For quite a few years now we have spoken about building a garage at our house. I seemed like this would never come to be – but now we have started the project. The first phase was to remove the old fence which I built when Philip was but just a baby! He slept in his pram in our garden whilst I dug the holes for the posts and installed the larch lap panels. Now its time has past and it must give way for the garage with construction starting the following day. On this occassion Philip is lending a hand! Picture Philip on the other side of the fence about 10 meters back poised to make a run for the fence. Now imagine him, travelling at full speed and colliding with the fence! The fence gives way, such is the severity of the impact!!! 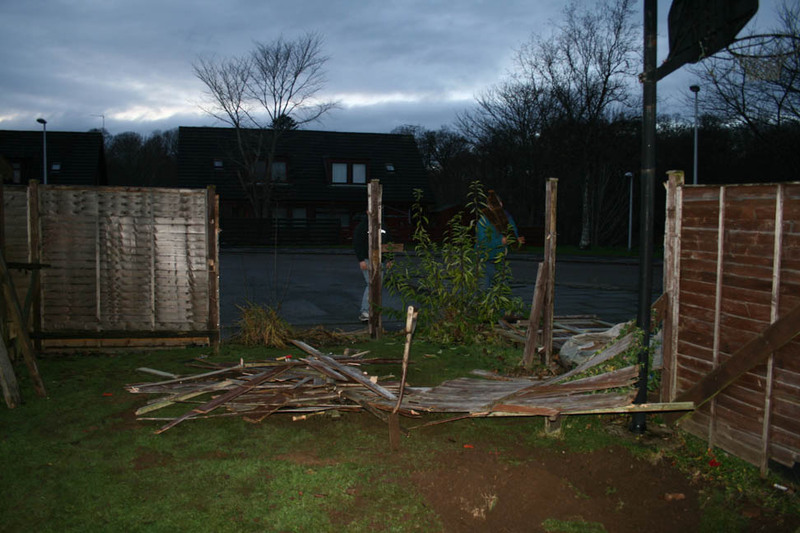 and Philip comes crashing to the ground along with the fence panel. So there we have two objects about the same age and the fence giving in after 20 years of faithful service 😉 No need for conventional tools like crow bars and hammers etc. Just a moderate application of brute force.